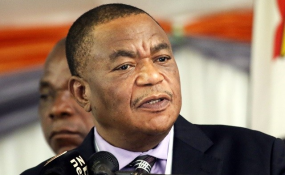 Vice President Constantino Chiwenga (file photo). Vice President Constantino Chiwenga represented Zimbabwe at the inauguration of the Democratic Republic of Congo's new president Felix Tshisekedi after disputed elections. Upon returning to Zimbabwe, Chiwenga spoke to the ZBC at Robert Mugabe International Airport in the capital. Commenting in the vice president's remarks, exiled former information minister Professor Jonathan Moyo said simply; "Asante sana!" He later quipped; "I think home misses me!"